Feng Shui Blogger | Sana Ako si Ricky Lee! Delayed Curing Feng Shui Problems Can Be Detrimental! As mentioned in the preceding post, my article will mostly concentrate on empowering you to do your basic Feng Shui and also to focus on the amulets that can help you. As I was contemplating what to write first, I realized that the past few days I have been besieged by readers who are experiencing some serious problems now because of delaying on some important Feng Shui decisions. Jessica is a pre-school owner who was born in the year of the rat. She claims to be a silent reader who never had the need to contact me for anything. However, this year she decided to get in touch with me because she read that it is going to be a difficult challenging year for most people born under the year of the rat. Jessica clarified that she read this not only on my blog but also on other Feng Shui sites. When I got to talk to Jessica whom I have never met in person, she clarified that her only belief in Feng Shui is only up to the extent of reading them, doing what she can do, and she was quite frank in telling me that she has never believed in amulets or Feng Shui cures. She said that she follows more the teaching of Joey Yap where there is no need to use Feng Shui cures or charms or even amulets. So, when she called me she only wanted to know how can she be protected “naturally” and perhaps with a little chanting of mantras. Needless to say, I told her how she can be protected, but as a responsible Feng Shui writer or Feng Shui blogger I cannot not tell her that she needs Feng Shui cures or Buddhist amulets to help protect her this 2018. She was pretty brutally frank in telling me that she really doesn’t believe in amulets and Feng Shui cures. And she also added that she was just asking for natural protection to appease herself because really her school is doing so well and that she believes that everything is going to be fine. “Besides something really terrible must happen before I will experience those dreadful things that you wrote about the rat.” She frankly and somewhat rudely told me. That was December of last year. Just very recently, while I was in “hiatus” in the “almost goodbye” state that I wrote about, Jessica called me. Well, she called and called and emailed and constantly sent messages until I answered. Apparently, she said she is desperate. All the things she said that will not happen unless a terrible thing happens happened. Well, it started with that terrible thing that she said has to happened first. In one of her school event, the stage where the students are performing for the parents collapsed! Seriously hurting 4 kids. One with a broken bone and the other one with a serious head injury and the other two with serious body wounds. To make the long story short, she was sued, and she has to assume the hospital and other medical bills. These are kids from rich families, and the medical bills didn’t come cheap. She is about to go through court hearing, and to top it off several parents pulled out their kids and demanded a refund. The parents also said that when the accident happened, the school teachers and officers were not prepared and equipped to handle an emergency. While in the middle of this, she also found out that another teacher whom she really trusts has recently contacted another pre – school owner and negotiated that she be hired there with a higher pay and position. So, Jessica contacted me to ask for my help. She wants to get the SPECIAL GOLD PIYAO and all the other amulets that was “prescribed” to her before, and she is asking me how soon it will have an effect. Another reader experienced a similar thing, Patricia is a reader from Spain. She was born in the year of the Dragon. When she contacted me she just wants to ask me whether it’ll be good for her to transfer to a new company. She works as a graphic artist. In the process, I saw something in her chart and told her that she will need the VAJRAPANI RUEL and maybe the SPECIAL GOLD PIYAO as well. She is interested but she said they find the amulets quite pricey. Explained to her why authentic and powerful are pricey, that they are not really buying it but the stipulated amount covers for the cost of the amulet, and that they are used as an offering to the temple or for feeding novice Buddhist monks or nuns. She said she is not interested but that she will be careful. Also during my “hiatus” I got a long-distance call from an unknown number. When I answered, it was Patricia, and she was a little frantic. She was laid off from work and she found out about this after she spent her (approved) vacation of 2 months in Thailand and here in the Philippines (Iloilo, Boracay, and Bohol), and what’s worst is that she recently used her last savings as a down payment for a new car! It has 3 weeks and she has applied to more than 10 companies and she has not heard from them. She is asking me what to do. Told her to chant mantras, and unfortunately while she thought of getting the amulets now she doesn’t have money for it anymore. Both Jessica and Patricia had time to save themselves from experiencing the things that they had to go through. However, they didn’t prioritize protecting themselves maybe because one this doesn’t seem to be tangible, and also everything seems to be going really well at that time they found out about what they need. The sad thing is although I’m writing only about the story of Jessica and Patricia, the truth is I know of a lot of people who are currently experiencing some hardships because they refuse to trust their gut feel about Feng Shui. One lesson which we all have to learn is when to listen to our gut feel. To our instinct. When to discern when that the doubt in our head is really a doubt or our logical mind not understand how Feng Shui and amulet works and creates a defense mechanism of doubt. I would like to humbly suggest this. When it is not in your consciousness and it was brought to your consciousness with no apparent reason or by accident it is most likely a positive force telling you something. Or when you accidentally meet a person who tells you something that brings Feng Shui or amulets to your attention, or when you are online searching for something and brings your attention to something that even for a briefest moment makes you think that you need, then that will most likely the universe telling you to act. Don’t delay fixing and protecting yourself with the use of Feng Shui or Taoist amulets or Buddhist amulets, because sometimes it will be detrimental. Once in a while we come across something so simple and yet it is amazing how much blessings that thing brings into our life. As a Feng Shui writer or Feng Shui blogger who has been fortunate enough to be instrumental in sharing some of the most powerful amulets in the Buddhist pantheon, I’m no longer surprised to be at the receiving end of wonderful miraculous stories brought about by amulets or Feng Shui charms. I have long known of the power of a Piyao (also spelled or called as Pi Yao, Pixiu, Pi Xiu, Pixie, Pi Xie), and since I learned Feng Shui more than 20 years ago, I was never without a Piyao on my body. Most of the time, it’s jade Piyao, but briefly one time I also was lucky enough to get the gold Piyao pendant of Lillian Too. Although this was short lived because I have passed it on to my sister at a year when she needs it and so I reverted back to a jade Piyao. Why jade and gold? This is because a Piyao is only quite powerful when it is made of gold or secondarily Jade. And a lot of my regular readers would know that I also always stress that the Piyao should be preferably on active stance and not on the relax position. But more than needing it now, as mentioned, it is something that I was never without since I learned Feng Shui, because a Piyao is indeed one of the most powerful Feng Shui cure or protection one can have, at any time, and any place. Of course, even before I started this blog, I have met people who will also attest to the power of having a Piyao on one’s body. However, today I would like to share with you two different stories shared by some readers who have gotten a Piyao for themselves, specifically the Special Gold Piyao of Guru Lama. What makes this truly special aside from the design is that the gold use here is that what I called an empowered gold, because the gold in various forms was put under an image of Buddha then it received for several years the power from the mantras, sutras, or pujas performed or chanted by Bhiksus, Bhiksunis, or High Lamas like Guru Lama. This is what makes the gold really special and it tremendously adds power to an image of Piyao, which is this case was specially designed by Guru Lama. Today, allow me to share 2 stories from readers who have received a Special Gold Piyao. First, is the story of Len, a businesswoman. A few weeks ago, one of their valued clients called her up to humbly inform her that they won’t be renewing their contract because the company is cutting cost. And thus, they have decided to go with two smaller companies with a slightly more competitive pricing. Both Len and her client was sad about this but as a businesswoman Len knows and understands that this was a business decision and she can’t blame her client for the client’s business has been affected of the bad economy of the country. And so, for her that was it, she already lost a client. When Len decided to get the Special Gold Piyao, she was not thinking of anything in particular, she just want to protect herself from the lack of wealth luck / money luck / financial luck of 2018. But about a week after she the Special Gold Piyao (SGP), her client called her up again and informed her that after reviewing their business moves or plans the day before, they have decided to renew the contract with Len’s company and forego of the two smaller companies. Len was really happy and she said she really feel it in her heart that it was because of the SGP that she got this particular client back. Another one is of another businessman. Let’s just call him J. J wears several amulets, and while he particularly likes and have been wearing a Piyao, and so was happy to get the Special Gold Piyao of Guru Lama, he wasn’t really expecting much since he feels that he has good life, one that is not free from worry but still a very good life. He wasn’t really expecting any miracles, and while he is a little worried about the coming year, he has ensured that this year will end good. And his earnings for the rest of the year has been more or less fixed and laid properly already. And so he was quite surprised, because a client apparently has an extra budget that needs to be spent and so that particular client decided to have another even in January, and because of the event J stands to earn an extra Php 350,000.00 to Php 450,000.00 or US$ 6,960.00 to US$ 8,945.00. Isn’t that a miracle, that amount as if simply falling off from the heaven! As I said, I’m still happy and amazed to know of these stories, but I’m not really surprised. Because I have long known about the powers of the Piyao and understanding how auspicious it is to have a gold that has been in the receiving of the power of the mantras, sutras, and pujas performed by Bhiksus, Bhiksunis, and High Lamas I actually expected that this Special Gold Piyao will indeed become really powerful. Incidentally, I just want to share the design of Guru Lama has been copied already. Will not state my stand about copy cats here because I have written about it extensively on a separate post. But having said that, one should remember that a silver Piyao may not work as well as a gold Piyao. And that a gold Piyao may not work as well as gold Piyao whose gold is blessed by various mantras, sutras, and pujas. Look What’s Under Your Bed! Early last year a friend invited me to become the godfather of their youngest child. The reception was held at the clubhouse of the subdivision where one of their friends lives. During the post baptism reception, the conversation turned into Feng Shui, because my now ‘compare’ and ‘comadre’ shared with them that I’m a Feng Shui blogger. It was then that their friend who lives in the said subdivision told me about his concern with his youngest brother who lives with them. The brother graduated from college a couple of years ago, but he seemed unable to hold on to a job for long. Everything will start out fine but he will soon have some trouble with work. He also confided that he has tried to consult professional Feng Shui consultants and they said that there is nothing wrong with the Bazi chart or Paht Chee chart of his brother, and that his house is Feng Shui compliant. Since we are already in the subdivision, I agreed to see his house and do a Feng Shui audit. Aside from some minor Feng Shui blunders, everything seems to be fine. I decided to check the brother’s bazi but even that doesn’t show any reason as to why he is unable to stay in a job for long and why would he always encounter problems. At this point my friend’s friend also confided in me that his brother always encounter some financial problems. I decided to check the youngest brother’s room again. And I really can’t see anything wrong. But it was at this point that I saw a little paper protruding from under the bed of the youngest brother. I pointed it out to my friend’s friend and he said that their helper complains that his brother is a little messy in the room and that they are only able to maintain cleanliness in his room because the helper always makes sure to clean it. My instinct told me to ask them to push the bed. They did. And under the bed, well, I really don’t know how to put it properly, but it was obvious that they never move the bed and there was a whole new world of under it. Voila! I know already the problem. We should always make sure that underneath of our bed are clean. If it’s full of dirt, it seems like we lie on top of dirt and thus bad things happen to our life. That was last year, when I saw them again a few weeks ago, the first thing they told me that his brother has stayed for more than a year already in his latest job. This is the first job that he has that he stayed for more than 4 months! And the brother has also started to invest in his own car. Much improvement, and they attribute it to the fact that they now make sure that it is always clean underneath their bed! I have been receiving calls and messages and even emails asking about my annual forecast. I’m sorry for the delay, my forecast is manually analyzed so it does take some time. While most Feng Shui sites has a pool of geomancers who do their forecast, this blog only has me to do everything, and coupled with the hectic December, it really takes time for me to finish this tedious process. I also make sure that I cross reference important points with my Guru Lama and my Feng Shui teachers. At the end, it took me several days to finish working on the charts and analysis. And it took me 10 days to write this long but simple post. Because I want to make sure that I put the right words into the analysis and the right cure. You will notice that I have streamed line the cures, I decided to simply put the best cures that I believe will work. As a Feng Shui writer I realized that I should act like a doctor and not confused my readers with a lot of ‘medicine’ I should simply recommend the best cure I think that will work. Also, in the past years I get a lot of complaints and request that I should put the pictures of the cures and enhancers everytime I mention them, because not all of you read all the forecast of each of the animal sign. I have heeded that request so that you don’t have to check online if you’re not familiar with mentioned cure or enhancer. So after this long tedious process, which consists of 22 pages and 13,752 words (the normal newspaper article is between 500 to 1,000 words) without the Notes and footnotes on the photos, I humbly present to you my annual forecast for each of the 12 Chinese Animal Zodiac (Chinese Horoscope). I will start with the good news, while there are signs that need to be extra careful like the Horse and the Sheep, this year there is no single Chinese Animal Zodiac Sign that will experience what the Ox went through in 2016. In 2016 amongst the 12 Chinese Animal Zodiac Signs, the Ox experienced a largely strong Wu Wang (#5 Flying Star, Five Yellow Star) and was devoid of any good stars, not to mention that the year was ruled by the #2 Flying Star or Illness Star, a star that causes not only illness but accidents also. This year, although the #5 Flying Star, which is also known as the Wu Wang or 5 – Yellow Star and will be alternately called as such on this post, is still quite strong. Although not as strong as that of in 2016, but one the Horse and the Sheep, also including the Monkey has to be careful because these two dreaded stars lands side by side. Thus increasing it’s negative effects. But still unlike in 2016, all the animal signs this year has some good stars, unlike what happened to the Ox, which was totally devoid of any good stars. On top of that the year is ruled by the #1 Flying Star also known as Victory Star. And having the White Victory Star will also aid some good energies to the both the Sheep and the Horse. There has been some confusion as to which animal sign has the best luck this year. Some say it’s the Rat, but I personally consider that it is the Ox; the only difference is that the Rat has some constant positive energy across all age groups, while with the Ox, born in 1961, where they experience bad financial luck. However, this can be remedied. On a personal note, I’m quite happy that the 2016 Year of the Fire Monkey is about to end already. This is because both on a personal level and as a Feng Shui writer or Feng Shui blogger and as reluctant Feng Shui consultant, I personally saw or heard a lot of troubling stories about people who were severely affected by the really strong Wu Wang this year that hit the Northeast, thereby severely affecting all those who stays in the Northeast and people who were born under the year of the Ox and Tiger. This coupled with the #2 Flying Star, which is the ruling star of 2016, thus creating a lot of accidents and illness. I personally have people who are relatively close to me or readers or their relatives and friends who had accidents and or fell ill and passed away. A lot of them are Ox and Tiger born. In fact, in Hollywood, they called these negative things that happened in 2016 as the ‘Curse of 2016’. And I bet a lot of you might have encountered some people who have experienced a lot of negative things, especially those who got sick or died. Obviously, not all these people are born in the years of the Ox or Tiger, but I’m willing to bet that a lot of them are and a lot of them are and/or a number of them fell ill and passed away without so much warning. All these are happening because of the very strong Wu Wang and the dominating energy of the year, which is the Illness Star. Again the illness star is a star that causes illness and accidents also. The truth is according to my Guru Lama all the killings that happened in the Philippines, and also abroad are effects of the illness star. Chances are this will lessen on 2017, but if we are to look at the annual Bazi chart, it will not be totally stopped. I also would like to note that Chinese New Year officially comes in on January 28, 2017 and the full shifting of energies comes in on Feb. 4, 2017. However, again don’t be surprised if you feel the shift of the energies as early as now. And there is also a prevalent Feng Shui theory that the negative energies become harsher towards the end of the lunar year. At this point, I still would like to warn people who are in the Northeast, and people born in the year of the Ox and Tiger that the month of January is still not a very good month. The way to deal with this is simply to put your protective amulets and continue to chant mantras, recite sutras, and pray hard. NOTE: That on the Year of the Fire Rooster this 2017, everybody should try to citrine, either as a bracelet or necklace or ring. It is also quite important that all of us should wear a gold Ksitigarbha Bodhisattva (Earth Store Bodhisattva) pendant. Look for gold Ksitigarbha Bodhisattva / Earth Store Bodhisattva similar to this one. Please note that this seems to be Bronze. However, what we need is gold. Anyway, before I proceed to the main forecast, this year I would like to keep it simple. In the previous years, I always go into detail with the Bazi or Paht Chee analysis of each animal sign and I also discuss all the causes of the good or bad luck of an animal sign. I have been receiving emails that some people find it quite confusing. So I have decided to keep it simpler, although I will still put some of the cause, because I believe that educating my readers about the stars will help you arm yourself in the future without relying too much of Feng Shui consultants or Feng Shui writers like me. Here now is my 2017 Year of the Fire Rooster Feng Shui Forecast for the 12 Chinese Animal Zodiac Signs (Chinese Horoscope). This is going to be quite a good year for the people born under the sign of the Rat. This is a year where you will shine and this is a year wherein you should not be timid and you should take hold of the blessings that surround you. You have a very good life chi and spirit chi, this means that you will be ‘full of life’ both literally and figuratively speaking. This year you will see yourself reaching new heights of success and with an extra boost of morale. Change is also one of the keywords for people born under the year of the Rat. I’m not referring to change of career, although it can be that also, but you might be surprised with some unexpected upward development in your place of work or business. This is especially true for the 45 – year old rats. Although I mentioned change as one of the keywords of your luck this year, this doesn’t mean that the instability that usually comes with change will be present. No you will prove that stability can be present in change. In fact, you will find yourself financially stable. If you want to enhance this good luck, it will be nice if you can carry a Vajrapani Ruel to give you that boost of positive luck and make it your winning edge, or you wear an image of Earth Store Bodhisattva made of gold and as a pendant. Your main star in the Flying Star Formula shows that you have the #6 Flying Star, which is also known as the Heaven’s Blessing and Mentor Star. As the word connote it is a star that helps you tap into the blessings from heaven and also this is a star that gives you the blessings of a mentor. Meaning this year, especially when you need it most, you will encounter people who would be willing to help you achieve your goal. Mentor here means these are people of stature who can help pave the way for you, but it also means it can be friends, family or colleagues who can help you in your path to success. You just have to be open and sensitive as whom these people are. In Feng Shui it is advisable to activate this star by inviting an image of a Buddha or Bodhisattva or Deity or Taoist Gods into your life both as image that can be placed at home or something that you wear. For this year I strongly suggest the image of Earth Store Bodhisattva made of gold. Gold for the high yang energy that comes with it’s metal element that we need for resources. The other good news is that the Rat also as a Big Auspicious star lend to him from the side of his zodiac ally the Ox. This is quite good because this star helps to bring in good luck or good fortune. For this year, activating this star will help bring in tremendous amount of wealth and fortune. You can activate this by inviting an image of a golden Ox (again gold because you will need the yang energy of gold and at the same we all need to strengthen the metal element for us to activate the resources energy, which will spell a lot of difference in this year’s luck as shown in the year’s Bazi chart). And as mentioned the year’s success and failure of each person is determined by the power you hold and so aside from the citrine that we all have to wear, in activating the Big Auspicious Star, it will be good if one can get the image of a golden Ox that is on top of a Jade. Jade aside from being an earth element, jade is also a symbol of power, so in activating the Big Auspicious Star, you will also need the jade to strengthen your power this year. Unfortunately, the Rat also has some bad stars brought about by the 24 Mountain Star Formula, namely the Star of Reducing Energy and the Yearly Conflict Star. The Star of the Reducing Energy may help weaken your life force and spirit force and physically you may also become weaker. To help protect yourself from the negative energies of this star, it may help for you to have the new Illness Suppression Amulet (I still don’t have this with me at the moment) or the Windhorse and a Wu Lou (also known as Wulou or Holy Gourd). Remember that you are in indirect conflict with the Tai Sui (Tai Suey or Grand Duke Jupiter) God of the year. It will definitely help if you carry a Piyao (Pi Yao, Pixiu, Pi Xiu, Pixie, Pixie) that has an active stance. Piyao Pendant made of jade. In terms of over – all health forecast the 9, 33, and 69 – year –old Rats should be careful about their health. This is base on the annual Bazi Chart or Paht Chee chart of the year, then cross reference with the Bazi or Paht Chee of the Rat. This should not be a very major concern but it is best to take caution. To manage this, one can wear the Illness Suppression Amulet or an image of Medicine Buddha or a Wulou. The Wealth and Financial Forecast for the people born under the sign of the Rat is extremely positive, this is again base on the elemental formula base on the Bazi Chart or Paht Chee Chart. However, it might not come as easy as for the 21, 57, and 81 – year – old Rats. But carrying a Vajrapani Ruel with you should help negate this slight imbalance. If you’re skipping all the forecast of the other signs, please make sure to check out the continuation at the end of the forecast for the PIG. I’m so excited to write about this year’s forecast for the Ox. You see when I was writing about what’s in store for people born under the sign of the Ox for the 2016 forecast, I was struggling really hard to ensure that I will not sound so pessimistic, because of the very grim prognosis for people under the sign of the Ox. I still remember that I was struggling to say something good and positive, which was made really difficult because all the formula shows only negative things, and indeed 2016 was one of the worst time for people born under the sign of the Ox (and Tiger). Although, we’ll have to wait until January 28, 2017 and for the stabilization of the energies of Feb. 4, 2017, the good news for people born under the sign of the Ox is that if last year, Ox has the worst luck, this 2017 Year of the Fire Monkey, Ox born people has the best luck! If we are to look at the elemental formula forecast base on the Bazi Chart or Paht Chee chart of the year and cross-referenced with the Ox’s own Bazi Chart, the luck of Ox is only average. This is although technically speaking that ruling Chinese Animal Zodiac of the year, the Rooster, is an ally of the Ox. This has something to do with the relationships of the elements base on Paht Chee chart of the year. However, this shouldn’t be a cause for despair, because both the Flying Stars Formula and the 24 Mountain Stars Formula shows only good stars!!! If last year the Ox is surrounded only of negative stars from all formulas, this 2017 Year of the Fire Rooster the Ox is only surrounded by good stars, and that more than compensates for the average elemental luck. Still, the average elemental luck base on the Paht Chee should be remedied, especially towards the end of the year the energies will tend to be hostile. For this, I highly recommend that all Ox – born people should wear a citrine. It can be a bracelet, a pendant, or a ring. In fact, I recommend getting a new set of citrines to make the energies fresh. Then this average elemental forecast or luck should be boost by wearing an image of the Earth Store Bodhisattva made of gold. Again, it is important to wear it in gold because one needs the yang energy of the gold and we need to activate the resources energies by using strengthening our metal element. Earth Store Bodhisattva will also be the protector for the hostile energies towards the end of the year. People born under the sign of the Ox enjoy a harmonious relationship of the energies thus paving the way for a smooth flow of energy (most of the time). Ox born people has the Spiritual Chi and Life Chi needed to rise above problems and obstacles that they might encounter this year. Although this is actually only average, the natural harmonious energies in favor of the Ox should make this stronger. But the best way to further strengthen this is simply to wear an image of Earth Store Bodhisattva (Ksitigarbha Bodhisattva) as a gold pendant. Most Feng Shui experts and consultants, especially my Feng Shui teacher, believes that there is something major good that will happen to most Ox – born people. While in 2016 the Ox has the dreaded Wu Wang (#5 Flying Stars, Five Yellow Star) as their ruling star, this year the Ox has the #4 Flying Star also known as Romantic and Scholastic Star. For single Ox this means that there is a stronger possibility of finding one’s love. For those who are partnered or who are attached, this means that your love for each other will be stronger, but it could also mean the possibility of the a 3rd party getting involved in one of you or both of you. The usual cure for this is to have the image of a rooster with a fan. However, this year the rooster is afflicted with the #3 Flying Star also known as the Argument Star so bringing in this symbol will make couples argue. So instead you can put an amethyst geode at the foot of your bed tied with a red string. Having the Surangama Mantra Amulet should also protect you from 3rd party interference. But this also means that scholastic luck is going to be good this year. For students, you’ll find yourself learning the lessons easier. And for those who are involve in careers, or businesses, or jobs that involves research this should also mean that this should be a good year for you. Furthermore, it is surrounded by the good flying stars 168! As I said, last year even the 24 Mountain Stars formula only shows negative stars. This year, the Ox is only surrounded by good stars. The first of these good stars from the 24 Mountain Stars formula is the Earth Seal Star, this stars helps boost your life chi but at the same time it help strengthen your stability. To further strengthen this again it would be wise to wear a gold Earth Store Bodhisattva pendant. The Ox also has the Big Auspicious Stars, and I’m not talking about one Big Auspicious Star, but two Big Auspicious Stars! This is, well to be redundant about it, extremely auspicious! This has the potential to give the Ox – born people some windfall luck, especially about unexpected income or wealth! Furthermore, this may help bring an Ox person to a new level of success in terms of career or business! There is no need for the Ox to activate the said star because unlike the Ox it landed on the Ox’s sector. The Ox – born people will also enjoy good health. However, the 32 and 68 – year – old Ox can be prone to some illness or accidents. So it is better to wear the Illness Suppression Amulet or an image of the Medicine Buddha or a Medicine Buddha prayer wheel. This is a sample of a Medicine Buddha pendant. This is similar to the one released by Lillian Too. Photo lifted in Google images. I’m sure the Ox – born people will be very happy to find out that generally speaking wealth luck is going to be really good! This is especially true for the 44 and 68 – year old Ox. This is where I slightly differ in perspective, and upon confirmation with my Feng Shui teacher he agrees with me that the 80 – year – old Ox also has a good wealth luck, it may not be as good as the 44 and 68 – years – old, but still good. However, amongst the Ox – born people, the 20-year – old and the 55-year – old has law wealth luck. In fact, some Feng Shui expert will put it as bad. This has something to do with 20 and 55 – year – old elemental luck. But there’s no need to worry because you can simply invite the wealth luck of the ‘other’ Ox. You do this by wearing or carrying an image of a gold Ox (pendant) on top of a Jade. Why gold? Gold again for the yang energy and the energy of wealth that is found in gold, again jade because it is a symbol of power and also has the earth element, which is the direct energy of power this year. Again, as mentioned this year who has power has the upper hand on everything. In getting this look for an Ox that looks ‘young’ and in active stance but still relax. This one is a perfect example. This one also has the symbol of luck inscribed on the Ox. In 2016, the Tiger has the second worst luck and was only saved by a good star from the 24 Mountain Stars Formula. This year, the Tiger also enjoys almost the same luck with that of the Ox, but is tempered by some bad stars from the 24 Mountain Stars Formula. So you see, it was the reversed of what happened last time. But what a Tiger – born person should remember is that while there some obstacles that might have to be dealt with, the 2017 Year of the Fire Rooster can have some very auspicious blessings and great success in store for you. Remember that you are almost as lucky as the Ox this year, but unlike the Ox where they seem to be always met by blessings and opportunities, you will have to look or open the door yourself. You need to be aggressive. To help take away these obstacles to your full success, I highly recommend that you carry the Vajrapani Ruel, which is considered as the most powerful amulet in the Buddhist pantheon. The Vajrapani Ruel should also help in strengthening your weak life chi and inner chi. And to strengthen your power and put stability to the already conflicting year as discussed in the first part of the 2017 Year of the Fire Rooster forecast, wearing a gold Earth Store Bodhisattva (Ksitigarbha Bodhisattva) pendant should help you achieve and access the luck that is already for you. Like the Ox, you also have the #4 Flying Star, which is also known as the Romantic and Scholastic Star. While in 2016 the Tiger and the Ox has the dreaded Wu Wang (#5 Flying Stars, Five Yellow Star) as their ruling star, this year the Tiger and the Ox has the #4 Flying Star also known as Romantic and Scholastic Star. For single Tigers this means that there is a stronger possibility of finding one’s love. For those who are partnered or who are attached, this means that your love for each other will be stronger, but it could also mean the possibility of the a 3rd party getting involved in one of you or both of you. The usual cure for this is to have the image of a rooster with a fan. However, this year the rooster is afflicted with the #3 Flying Star also known as the Argument Star so bringing in this symbol will make couples argue. So instead you can put an amethyst geode at the foot of your bed tied with a red string. Having the Surangama Mantra Amulet should also protect you from 3rd party interference. But this also means that scholastic luck is going to be good this year. For students, you’ll find yourself learning the lessons easier. And for those who are involve in careers, or businesses, or jobs that involves research this should also mean that this should be a good year for you. Luckily you also have the Big Auspicious Star, and like the Ox you don’t need to activate this star. This star should help you achieve new heights in your career and wealth luck. And this should also temper the Robbery Star from the 24 Mountain Star Formula that goes directly into your sector. The Robbery Star as the name implies loss from malicious intent of wealth, recognition, or even good name. More importantly this also strengthen the possibility of a 3rd party interference in relationships of those who are already partnered or attached. But putting an amethyst geode with a red string and wearing the Surangama Mantra Amulet should help prevent the interference of a 3rd party. Aside from the Robbery Star, you also have the side affliction of the 3 Killings (Three Killings). But with the Vajrapani Ruel this would have been addressed already. Generally speaking the health forecast for all Tiger – born people are not so good to average only. But the 31 and 55 years old Tigers should take the most caution. Remember in Feng Shui illness can also mean accidents that would result to illness and maybe even death. So it will be good for all Tigers to have either the Illness Suppression Amulet, or Medicine Buddha pendant, or Medicine Buddha prayer wheel, or a Wu Lou (Wulou, Holy Gourd). A sample of a Jade Wulou or Holy Gourd. I personally prefer a jade wulou with a darker shade of green. This picture was lifted from Google images. Again the wealth forecast should be good, especially if a Tiger person is able to create his own opportunity. 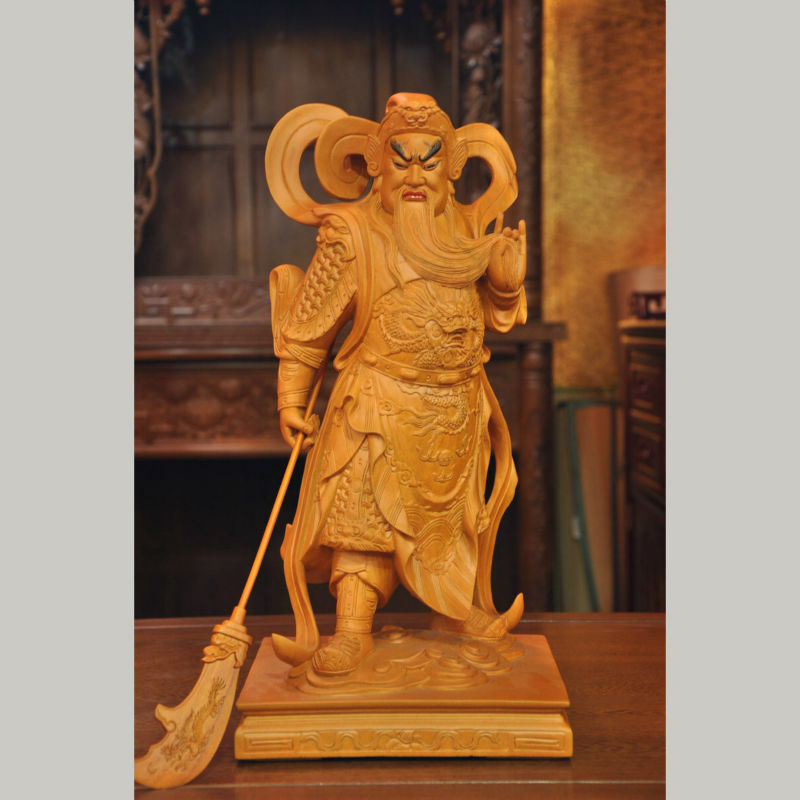 So it will help if a Tiger – born person will wear a citrine with a 9 – eye DZI and also wear or invite an image of Kuan Kong (also spelled as Guan Gong or called as Guan Yu or Sangharama Bodhisattva) into their home. Like the Tiger – born people, the Rabbit also has a lot of potential this 2017, but you shouldn’t be timid about it. There is a wide range of opportunities and luck for you as a long as you ‘create’ the opportunity and look for the door of good luck yourself. This year, the Rabbit should focus more on his or her professional life rather than dwell on family life. I’m not saying that one should be simply career oriented; it’s just that a Rabbit – born person should learn more to handle the pressures of a family life that may be a little troublesome. But simply dwelling on them might create more problems. However, for these potential family problems you can simply put a Traditional Sutra Amulet in your house and should help ease the possible occurrence of a family tension. You can also invite the image of Kuan Yin and this should also help ease family concerns. And to be able to create more opportunities for yourself, have the Vajrapani Ruel or an image of Kuan Kong worn as pendant. The Tiger – born person should also realize that the best thing that happened to them this 2017 is the landing of the #8 Flying Star also known as the Wealth Star into their sector. This means money luck or financial luck should be within reach as long one creates an opportunity for it to come in. To further enhance this star you can invite as a gold or jade pendant the image of either Maitreya Buddha (Happy Fat Buddha), Kuan Yin (also spelled and called as Kuan Shi Yin, Guan Yin, Guan Shi Yin, Avalokitesvara, Kannon), Sangharama Bodhisattva (also known as Qie Lan Pu Sa, Kuan Kong, Kuan Yu, Guan Gong, Guan Yu) or Ksitigarbha Bodhisattva / Earth Store Bodhisattva (gold only). This is from my personal collection. I wear this pendant everyday. In choosing an image of the Happy Fat Buddha to be worn as a pendant, always look for the face. Make sure that it has happy jolly face. Unfortunately, the presence of the Three Killings in the sector might pose some problem. However, this is a star from the 24 Mountain Stars Formula that is quite easy to deal with. All you have to do is carry the image of the Three Celestial Guardians, namely the Piyao (Pi Yao, Pixiu, Pi Xiu, Pi Xie, Pixie) or the Kalachakra pendant made of gold or jade or clear quartz. The other cause for concern is the presence of the Natural Disaster Star, despite of it’s name the Natural Disaster Star can be a natural disaster or man – made. For this 2017, this may mean that you would be severely affected by natural disaster, but the way I read it and analyze it is more with the Man – made disaster. Like the Ox you might be greatly affected by the possibility of the man – made disaster that may happen on the 3rd or 4th quarter of the year. To protect yourself it is important to wear the Kalachakra pendant made of gold or jade or clear quartz. And also a gold Earth Store Bodhisattva (Ksitigarbha Bodhisattva) pendant. This should be done even before the entry of the Chinese New Year! The Rabbit – born people is directly confronting the Tai Sui god of the year. Thus it is important to appease the Tai Sui (also spelled as Tai Suey or called as Grand Duke Jupiter) by wearing an image of the Piyao (Piyao, Pixiu, Pi Xiu, Pi Xie, Pixie) and or participate in a Tai Suey Ritual. Always get a Pi Yao pendant that has an active stance. Health wise the Rabbits are getting an average reading but the 30, 54, and 90 – years – old Rabbit needs to take extra precaution. It is advisable for them to have the Illness Suppression Amulet or an image of the Medicine Buddha worn as a pendant or a Wu Lou (Wulou or Holy Gourd) also worn as pendant. Wealth forecast for Rabbit – born people are generally good. They just have to be aggressive and use wisdom to create opportunities. However, because of the side affliction with the Robbery Star they also have the potential to be robbed off of this wealth luck. Special attentions are addressed to the 30 and 66 years – old Rabbit. So having either the Vajrapani Ruel or the Kalachakra pendant made of gold or jade or clear quartz should definitely remedy this. While it won’t be a very easy year, your affinity with the ruling sign of the year, the Rooster, should give you some very positive chi to help you become successful. It will be a year wherein hardworking Dragons will be rewarded with some wonderful career and financial blessings. The keywords for Dragon – born people are perseverance and optimism. As mentioned in the post entitled “2017 YEAR OF THE FIRE ROOSTER FENG SHUI FORECAST BASE ON THE BAZI CHART, FLYING STARS FORMULA, AND 24 MOUNTAIN STARS FORMULA: A BALANCED CHART BUT A CONFLICTING YEAR (PART 1)”, this is going to be a year that is going to be ruled by power, so as a Dragon, you naturally have this energy, however, some of you will have to really enhanced it. You can do this by wearing a Ru Yi (also spelled as Ruyi), which is called a Power Scepter. Remember, things will only not go as smooth as you want it to be if you are not able to take the reign of power within your hands. People must see that power in you. Another very powerful tool to help you have power is for you to wear an image of Sakyamuni Buddha (Shakyamuni Buddha) in jade or gold. Wearing an image of Kuan Kong (also spelled and called Guan Gong, Kuan Yu, Guan Yu, Sangharama Bodhisattva, Qie Lan Pu Sa, Guan Sheng Di Jun) in jade. Shakyamuni Buddha Pendant released by Lillian Too. Always look at the face of the Kuan Kong pendant that you’re getting for yourself. The ‘braver’ the face the better. You should also be constantly be able to plan ahead and try to foresee some problems that may arise. Your energy or life chi might be a little low this year, but you have the power of the Lung Ta (Windhorse) with you and so this should help you along the way. One really wonderful news is that you have that the #9 Flying Star, which also known as the Multiplying and Future Prosperity Star. This star is neither good nor bad, but it has the power to multiply your karma. It means, that if you plan good deeds, you multiply your good karma and it gives you a future full of prosperity. However, if you do bad deeds, it will multiply your bad karma. So I write this in a positive note because that assumption is Dragon – born people will want to plant good seeds. To help enhance this star one can wear the Surangama Mantra Amulet. Another good news is that the 24 Mountain Stars brings you the Small Auspiciousness both direct and indirect thru the side sector. This is quite food because you will be blessed with small opportunities which you have the potential to make big. You should learn to be more aggressive. A timid Dragon will not go anywhere, so you have to be compassionately aggressive. Note the key words are COMPASSIONATELY AGGRESSIVE. One other way for you to tap into this power and at the same time resources is to wear the image of Earth Store Bodhisattva (Ksitigarbha Bodhisattva) pendant made of gold. According to Sakyamuni Buddha, Bodhisattva Ksitigarbha is the source of power of the earth and so wearing His image should help you have the earth power right from it’s source. But at the same time the gold represents resources and it carries with it an intrinsic yang energy that we all need. Unfortunately, there is some bad news also brought about by the 24 Mountain Stars Formula. First, you have the Yearly Killing Star, which is a star that has the power to bring in a some problems and hindrance to blessings and success. Please note that this star resides in the sector of the Dragon, so its effect is quite strong. To help counter this, you should wear the Kalachakra pendant either in gold or jade or clear quartz. Furthermore, you also have the Star of Three Killings (3 Killings), which can cause some trouble also. But it is quite easy to deal with this star. You can simply carry an image of the Three Celestial Guardians or again the Kalachakra (made of gold or jade or clear quartz) worn as a pendant. The 17, 53, and 77 years old Dragon should be careful with their health or safety. You can wear either the Illness Suppression Amulet or an image of the Medicine Buddha. The 29 and 65 – years –old Dragon will have the best financial luck. While the 53 – year – old Dragon will have moderate money luck. But then again it is there you will just have to exert a little effort to really be able to tap into it. And as mentioned above all Dragons will need to have power to tap into their wealth. Remember earth element controls power this year so wearing some gemstones should really help. Citrine should be the best because it is also a money stone. The 41 – year – old Dragon though has the tendency to lose some money this year. They will have to be really careful and it will be extremely good if they have the Vajrapani Ruel with them. This is a picture of a real citrine. Compare it with the above picture of the fake citrine. A real citrine will have inclusions. While there are some minor blockage cause by a side affliction, this year is going to be quite a good year for people born under the sign of the Snake. It is not going to an immediate successful year, but rather it will be steady gradual way to success and blessings. This should be a good year to start and planning for your long-term future. Remember, don’t expect something outrageously wonderful but rather learn to take pleasure in the small miracles that will often come to you in the Year of the Fire Rooster. These small miracles when harnessed properly may slowly bring you to new heights of success and wealth. The challenge is recognizing these small miracles. One of the best news for the Snake – born people is that you have the #9 Flying Stars, which is also known as the Multiplying and Future Prosperity Star. This star basically doubles your good karma and will help you have wonderful blessings in the future. But remember it also doubles your negative karma, so be good and think positive things only. To help enhance this star, one can wear the Surangama Mantra Amulet. Sadly, you are in side conflict or you are side afflicted with the Wu Wang or Five Yellow Star or #5 Flying Star. This is only a side affliction a gold Kalachakra pendant should be able to help and protect you from this star. However, you may still opt to get the Five Element Pagoda if you so wish. There are different versions of the 5-Element Pagoda. However, personally the original version and a small one, I believe, is okay and powerful enough to counter the effects of the 5-Yellow Star. The wonderful news is that you also have the Small Auspiciousness star, while this stars brings only ‘small’ blessings by way of opportunities, when you learn to recognize these blessings you have the potential to make it really big. One other way for you to tap into this power and at the same time resources is to wear the image of Earth Store Bodhisattva (Ksitigarbha Bodhisattva) pendant made of gold. According to Sakyamuni Buddha, Bodhisattva Ksitigarbha is the source of power of the earth and so wearing His image should help you have the earth power right from it’s source. But at the same time the gold represents resources and it carries with it an intrinsic yang energy that we all need. The 52 and 76 – years – old Snake should be careful and take care of themselves because they are quite prone to illness and accidents. It will be wise for them to have either the Illness Suppression Amulet or the image of Medicine Buddha worn as pendant, or a Wu Lou (Wulou, Holy Gourd). The 16, 40, and 76 – years – old Snakes will need the Vajrapani Ruelto help enhance their financial and wealth luck. While it is not as bad as what the Ox had to go through in 2016, it is still a rough time ahead for the Horse – born people. But the key element here is that they only have to see what a lot of Ox – born people had to go through in 2016 and the Horse should know that they would survive 2017. Learn from the Ox be resilient but importantly one has to prepare for 2017! Horse are sometimes quite impatient, remember that, and remember that you will need patience. Patience, perseverance, determination and also faith in yourself and in the higher being be it Buddha, Jesus Christ, Allah! But more than that you have to realize that you have to lie low ad avoid taking risk. Whether it is business risk, or risky physically avoid them. But remember, sometimes, although we don’t recognize this a lot, sometimes it is risk about our family members. Don’t be complacent. Unlike the Ox last 2016, this 2017 Year of the Fire Rooster, the Horse is gifted with a good elemental luck, which is base on the year’s Bazi Chart or Paht Chee Chart and cross referenced with the Paht Chee Chart of the Horse. You, the Horse, have good life chi and spirit chi and so these two good things will help propagate you to moving forward. You can further enhance this with the combined powers of wearing the Lung Ta (Windhorse) and having the Vajrapani Ruel with you. You will need two to help counteract the tremendous negative energy around you. The worst thing that affects you now is the presence of the Wu Wang or #5 Flying Star (Five Yellow Star) the most dreadful star amongst all the stars. Then you are also side afflicted by the #7 Flying Star known as the Violence Star. Let’s discuss the Wu Wang first. The Wu Wang this year is stronger than usual. Maybe not as strong as it was in 2016 in the Northeast, but it is still quite stronger than usual. Regularly speaking the Wu Wang or the 5 – Yellow Star is naturally considered as a dreadful star because it has the power to make really good things turn to really bad things. I have seen people lose their business almost overnight because of this affliction. This 2016 alone when it affected the Northeast and the Ox and Tiger, I saw a young man who is seemingly healthy die without any warning. I know some people who just went out to unwind then went home dead because of accidents. I have seen some people who seem to be totally in control of their business who seem to have lost everything just because of as ingle mistake. I have a reader who for no apparent reason the chandelier just fell off the ceiling and hurt her. It is imperative that you protect yourself from this and you do this by wearing a gold 5 – Element Pagoda pendant (it has to be gold) and carry a Vajrapani Ruel for the added protection! DO NOT IGNORE THE WU WANG! It is also imperative that you protect the South sector of your house and your office. If you have more than one house that is active (meaning where you stay every once in a while) you must protect all the South sector of all your active house. So aside from wearing the gold Five Element Pagoda pendant, you should also put the 5 – Element Pagoda (for display) in all your South sector. But this is where it gets a little more troublesome. Aside from being directly afflicted with the dreaded Wu Wang, you are also side afflicted by the #7 Flying Star known as the Violent Star that brings in a lot of misfortune and also harm to those who are afflicted. Because you are already naturally weakened because of the Wu Wang, you will be more susceptible than usual to the effects of this star. To manage this star, it is highly recommended for you to wear the Kalachakra pendant (made of gold or jade or clear quartz). And as if it is not enough you are also in side conflict with the Tai Suey (Tai Sui / Grand Duke Jupiter). To appease the Tai Sui God of the year, it is important that you wear a Piyao (Pi Yao, Pixiu, Pi Xiu, Pixie, Pi Xie). Gold Piyao pendants worn as amulets are also very auspicious. Having all these afflictions may prove to be a little troublesome and a lot of these have a natural element of the earth. So it is imperative for you to seek the help of the ruler of all earth, as described by Buddha Sakyamuni (Buddha Shakyamuni). It will prove to be beneficial if you can wear an image of Earth Store Bodhisattva (Ksitigarbha Bodhisattva) as a gold pendant. By wearing this it should strengthen you and give you power and also resources to give you the survival edge that you so need this 2017. Furthermore, it will be very helpful if all Horse – born people should put a Traditional Sutra Amulet (preferably The Sutra On the Past Vows of Earth Store Bodhisattva) inside their office and house. It is said that when you have the Traditional Sutra Amulet it is like the Buddha himself and his disciples, the Bodhisattvas, Arhats, Deities, etc. are also present. Another unfortunate thing that afflicts the Horse – born people this 2017 Year of the Fire Rooster is that their health luck is not so great. So it is advisable for them to wear the Illness Suppression Amulet, or an image of the Medicine Buddha. You can also chant the Medicine Buddha Mantra: TADYATHA OM BHEKNADZYE BHEKANDZYE MAHA BHEKANDZYE RADXZA SAMUGATE SOHA. Please note that since you are heavily affected by several negative stars, the Wu Lou will not work for you. Generally speaking money luck and financial luck doesn’t look really good for all the Horse – born people. But the 27 and 51 – years old Horse should take the most precaution. It might be good for all Horse to wear citrine, but for the 27 and 51 this is where the importance of wearing an Earth Store Bodhisattva gold pendant and having the Vajrapani Ruel will make the difference. I don’t normally talk about romance forecast, but there is some good news for single Horse – born people, and that is romance should be in the air this 2017 for them. For married or attached Horses, this romantic energetic can either be good or bad. It can enhance your relationship with your partner, but it can also mean that there will be a third party interference. To enhance the love between you and your partner, put the Double Happiness Symbol on your headboard or at the bedside table. To protect yourself, please wear the Surangama Mantra Amulet. Another bit of good news for the Horse – born people is that you are in side with the Small Auspiciousness Star. Although you won’t feel its effect it doesn’t mean that there is no good coming out from it. You are so side afflicted with the negative stars you won’t feel it’s effect. But this star will act as some sort of a buffer. My last words for the Horse – born people is that this year be the egg and not the potato in the boiling water. The potato softens but the egg hardens. The sheep is the second most afflicted Chinese Animal Zodiac. Last year it was the Tiger, the Horse this year has it better than the Ox, and this year the Sheep has it better than the Tiger. This is going to be a challenging year for the people born under the sign of the Sheep. Base on the chart of the Bazi there should be some sort of success, but it will be an obstacle filled path to it. So having the Vajrapani Ruel is highly recommended to make this path smoother. 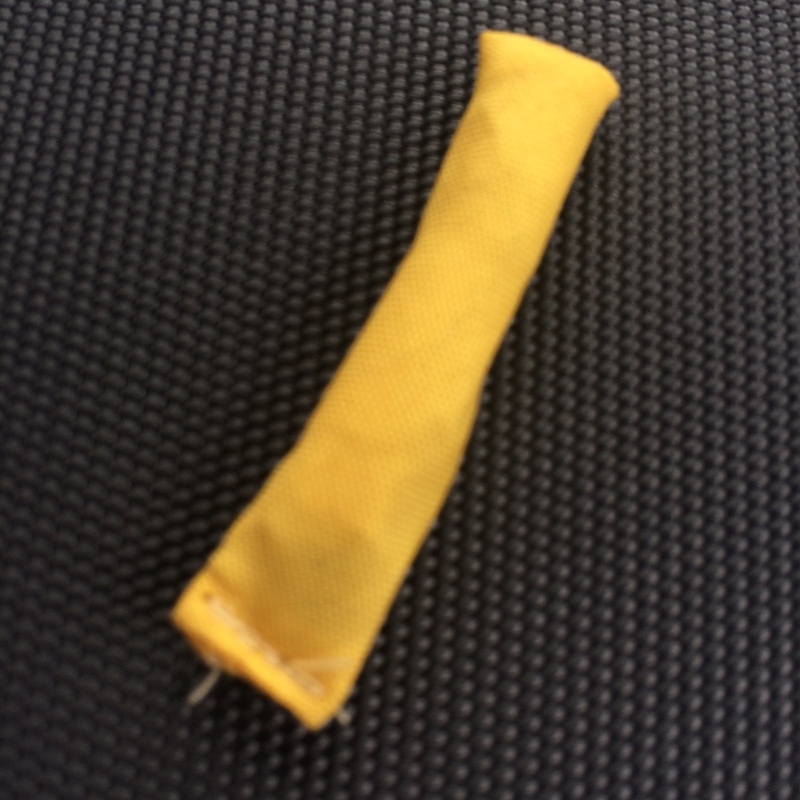 Your Lung – Ta or Windhorse is weak, and so wearing a Windhorse may prove to be helpful. A weak Lung Ta will prove to make your success a difficult thing to achieve. You can also have the Victory Banner either placed on your table or carried as a charm. Your Life Chi is also quite weak and thus you may be more susceptible to problems and stress. It is highly suggested that you wear a gold pendant of the image of Earth Store Bodhisattva (Ksitigarbha Bodhisattva) so that you will be given the extra boost with your natural earth element by the ruler of all earth energies. Furthermore, you will also need the power brought about by the image of Earth Store Bodhisattva (Bodhisattva Ksitigarbha) and the gold’s metal element should provide the resources you need to help you traverse the path to the success that is present but blocked by a lot of negative energies. One major concern is that you are afflicted by the #7 Flying Star known as the Violent Star. It is quite stronger than usual this year and so it is important that you get protected. Leaving yourself unprotected from this star may prove to be fatal both figuratively and literally. The best way to protect yourself from the effects of this star is to wear or carry with you the combined protective energies of the Vajrapani Ruel and the Kalachakra pendant (made in gold, jade or clear quartz but preferably in gold). Unfortunately, you are also side afflicted from the Wu Wang or the #5 Flying Star (Five Yellow Star), and this star is also stronger than usual, and you are also naturally weakened state because of the #7 Flying Star, so it is highly advisable for you to wear the gold Five Element Pagoda pendant. It is also imperative for you to protect you South with the 5 – Element Pagoda figure. Now for some good news, in your sector and on the side lands the Small Auspiciousness Star! This proves to be quite a blessing because it should help temper some of the negative effects of the negative stars that fall on your chart. And so with the protective amulets I mentioned and this two stars, you should not be affected as bad as you should be. The health forecast for the sheep is at best average. But the ones who really needs to take precaution are the 38 and 62 – years – old Sheep. It will be advisable for them to wear either the image Medicine Buddha or the Illness Suppression Amulet. Wealth luck is actually present for all the Sheep – born people, but it is highly deterred by the presence of the Wu Wang and the Violent Star. The most severely affected of this reverse wealth luck are the 26 and 50 – year – old Sheep. Thus it is highly advisable for them to wear an image of a Wealth God like Kuan Kong (Guan Gong, Kuan Yu, Guan Yu, Sangharama Bodhisattva, Qie Lan Pu Sa). Although also afflicted with some negative stars, the 2017 Year of the Fire Rooster proves to be generally a good year for those born under the sign of the Monkey. Success is always within reach if some effort is put into it. For those who are employees, a chance of a recognition or promotion is likely to happen this year. You have a weak life chi and so having the Vajrapani Ruel should be able to remedy this. The good news is that you a strong Spirit Chi and Windhorse or Lung – Ta, these two good energies should help propel you to success. Unfortunately, you are afflicted with the #7 Flying Star also known as Violent Star, this star has the possibility of to make things bad and even put you in danger both figuratively and literally. This star has proven to be fatal in the past. So it is best to protect yourself. Sometimes this is also called a Betrayal Star because it also has that effect, and with the Monkey this seems to be the energy this year. You might be betrayed by a person you trust with regards to money. To protect yourself it is important for you to wear the gold Kalachakra pendant and carry with you the Vajrapani Ruel. Fortunately, you also have two Small Auspiciousness Star and these stars may bring in opportunities that may become big depending on how you harnessed them. And since power is the main energy of the year, it will be good for you to wear the image of Bodhisattva Earth Store (Bodhisattva Ksitigarbha) as a gold pendant. 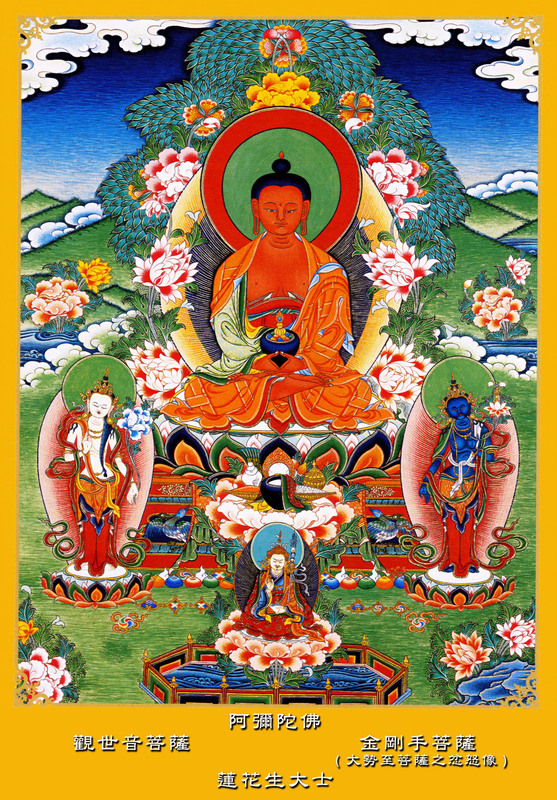 The Holy Bodhisattva will give you the power that you need so that you can totally harness the energies of the two Small Auspiciousness Star, and at the same the yang energy of the gold will help boost your life chi, to top it off the metal element of the gold will give you the resources that you need. Fortunately or unfortunately you also have the Yi Duo. This star has the power to magnify your energies so if you remain upbeat or positive the energies it attracts are also good. But if you become negative it will also attract such kind of energies. Thus it is important to remain upbeat. To help enhanced only the positive energies, it is highly suggested for you to have the Traditional Sutra Amulet, and for this purpose The Diamond Sutra is highly suggested. This is a copy of the big and small THE DIAMOND OF PERFECT WISDOM SUTRA (traditional sutra amulet and sutra amulet) that my Guru Lama sent me. They are quite limited. I only have 10 of the big ones, and 7 of the small ones. The 25, 61, and 85 – year – old Monkey should take extra precaution about their health and be wary of possible serious accidents. So it is important for them to carry or wear the Illness Suppression Amulet. Wealth forecast is quite good for the Monkey in general. The 25 and 49 – year – old Monkey will enjoy a good wealth luck and financial luck. The 37 and 61 – year – old Monkey should take more precaution in their dealings. Thus it is going to be good if they either have the Surangama Mantra Amulet or an image of Kuan Kong (Guan Gong, Kuan Yu, Guan Yu, Sangharama Bodhisattva, Qie Lan Pu Sa). Like in the past years, I would like to clarify that you shouldn’t assume that if the ruling sign of the year is the same with of the your sign, it doesn’t really mean that it is good. It all depends on the Bazi Chart (Paht Chee Chart) and the stars that goes into your sector. This year the combinations of the elements, and of the stars both from the Flying Stars Formula and the 24 – Mountain Stars Formula makes it an average or mediocre year for the people born under the sign of the Rooster. The truth is success luck should be quite good or better than average, however, the concern here is there may be some obstacle along the way that will dampen your inner chi and life chi. This may manifest in a slightly weaker physical state and weaker determination. And as I said this year who has the power would strive, thus it is highly advisable for you to wear the image of Bodhisattva Earth Store (Bodhisattva Ksitigarbha) as a gold pendant. Earth Store Bodhisattva should provide the power that you need and at the same time the metal element of the gold will provide resources for you along the way, and the yang energy of the gold should help boost your life chi. Another damper of your good luck is the presence of the #3 Flying Star also known as the Argument Star. Some Feng Shui experts also call this as the Quarrelsome Star. This year you will find yourself more argumentative and short tempered. This star also has the ability to affect all kinds of relationships and thus making it shakier. Your partner will have to be more patient with you, but you yourself should realize that you are not your usual self this year. It is quite important for you to have the Surangama Mantra Amulet and also if possible the Ksitigarbha Fireball. If you have the image of Bodhisattva Ksitigarbha (Earth Store Bodhisattva), His image will naturally have the Ksitigarbha Fireball. The Ksitigarbha Fireball is a very powerful tool to prevent arguments. I prefer that this is worn as a pendant. I also decided to put the Ksitigarbha Fireball on my WEALTH AND MASTER PROTECTION PENDANT. There are now many different versions of the fireball, I think this is just a marketing strategy to make people buy new items. Remember that the Argument Star will bring more than just plain arguments. It may cause legal problems, and trust me you’re on the losing end if you go to court and you have this star. Having either The Diamond Sutra or The Sutra On the Past Vows of Earth Store Bodhisattva as a Traditional Sutra Amulet should greatly offer protection to you. You are also facing the Three Killings, but carrying an image of the 3 – Celestial Guardian should take care of this. One good news is that you have the support of the Tai Sui God of the year. But it is important that you constantly appease the Tai Sui (Tai Suey / Grand Duke Jupiter), thus is important that you always carry or wear an image of the Pi Yao (Piyao, Pixiu, Pi Xiu, Pixie, Pi Xie). Health forecast is above average, but the 60 and 84 – year – old Rooster should take some precaution. Thus wearing the Illness Suppression Amulet or the image of Medicine Buddha or a Wu Lou (Wulou, Holy Gourd) should help. Wealth and financial forecast for all the Rooster is good. Though the 36 and 60 – year – old Rooster should take some precaution in their business dealing. Having the Vajrapani Ruel should help protect you. Another good news in that you have the side blessing of the Golden Deity star and this should provide you with help from the Buddhas or Bodhisattvas or Taoist Gods or Deities. Activate this by inviting an image of a Buddha or Bodhisattva or Taoist God or Deity and wear them as a pendant or put the image inside your house. I strongly suggest the following images of Kuan Yin Bodhisattva (Guan Yin, Kuan Shi Yin, Guan Shi Yin, Avalokitesvara, Kannon) if you can have the Thousand Hand Kuan Yin Bodhisattva the better, Earth Store Bodhisattva (Ksitigarbha Bodhisattva), Kuan Kong (Guan Gong, Kuan Yu, Guan Yu, Sangharama Bodhisattva, Qie Lan Pu Sa), Maitreya Buddha (Happy Fat Buddha), Goddess Tara, Yellow Dzambhala (Yellow Jambala), White Dzambhala (White Jambala), or The Monkey God – Sun Wu Kong. While it cannot be said that it is bad year for the Dog, neither it can be said that it is good. A lot of the luck that comes your way should highly depend on you. But one thing for sure is that you are extremely blessed with the presence of the Golden Deity Star. This should provide you with help from the Buddhas or Bodhisattvas or Taoist Gods or Deities that may prove to be the best thing to happen. Activate this by inviting an image of a Buddha or Bodhisattva or Taoist God or Deity and wear them as a pendant or put the image inside your house. I strongly suggest the following images of Kuan Yin Bodhisattva (Guan Yin, Kuan Shi Yin, Guan Shi Yin, Avalokitesvara, Kannon) if you can have the Thousand Hand Kuan Yin Bodhisattva the better, Earth Store Bodhisattva (Ksitigarbha Bodhisattva), Kuan Kong (Guan Gong, Kuan Yu, Guan Yu, Sangharama Bodhisattva, Qie Lan Pu Sa), Maitreya Buddha (Happy Fat Buddha), Goddess Tara, Yellow Dzambhala (Yellow Jambala), White Dzambhala (White Jambala), or The Monkey God – Sun Wu Kong. The Kuan Yin with the Heart Sutra is part of the Holy Trinity of Protection for the 2015 Year of the Wood Sheep. The sutra can be carried separately. I know I mentioned a lot, but for this year, it is best to invite the image of Earth Store Bodhisattva (Ksitigarbha Bodhisattva) as a gold pendant because He will provide the power from the earth element and the resources from the metal element of the gold. This is also a year where relationships will become better and might take a better part of your life over your career and financial success. There is also a big possibility of change. A big change that may come your way that is indicated in your elemental forecast! In fact, the Bazi Chart of the year and the Bazi Chart of the Dog shows harmony, making the elemental forecast your strongest armor this year. Your Life Chi, Spirit Chi, Inner Chi and Lung – Ta are all either above average or strong. So this should help propel you to success and achieving the things that you desire for. Carrying the Vajrapani Ruel with you should help to further enhance these energies. One bad news is that you are directly afflicted by the #2 Flying Star, which is also known as Illness Star but remember this is a star that doesn’t only causes illness but also accidents. This may affect you both physically and mentally and thus it is important for you to have the Illness Suppression Amulet and it is also equally for you to chant the mantra of Medicine Buddha (TADYATHA OM BHEKANDZYE BHEKANDZYE MAHA BHEKANDZYE RADZA SAMUGATE SOHA) 108x a day, everyday. Another negative star that comes to you this year is the Yin Chia Xing and this might make the Illness Star stronger. To protect yourself from the negative effects of this star it is important you have the Traditional Sutra Amulet inside your bedroom. If you are married, you cannot have the Traditional Sutra Amulet in your bedroom, so better to put it in the room where you stays the most, next to your bedroom, and put it there in high clean place. While the 23, 47, and 83 – years – old Dogs needs to take the most precaution, I would like to stress that all Dogs are affected by the Illness Star (a star that causes accidents and illness) so again it is best for you to have the Illness Suppression Amulet and the Traditional Sutra Amulet (TSA) because the (I repeat) Yin Chia Xing strengthens the effects of this star and the cure for this is TSA. While superlative Wealth luck forecast is not the name of the game. Wealth luck is average or above average for most Dogs. This is especially true for the 35 and 59 – year – old Dogs. For the other age groups who want to enhance their wealth luck wearing the image of Earth Store Bodhisattva as a gold pendant and wearing citrine should really help. This is quite a good year for people born under the sign of the Pig if we are to base it on its relation to the year’s Paht Chee Chart. There will be challenges ahead of you but you will be able to overcome them. This is a year wherein you have the potential to shine and improve your current situation. The best news is that both your Spirit Chi and Life Chi are quite strong. Thus giving you an advantage already. However, your Lung – Ta or Windhorse is quite weak, thus it might create some hindrance, however, simply having the Vajrapani Ruel should address this concern or wearing the Windhorse pendant should also address this. One of your major concern is that you have the #2 Flying Star also called as the Illness Star (a star that cause both illness and accidents), which is further enhanced by the presence of the Yin Chia Xing. 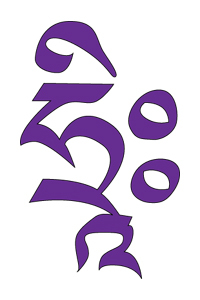 You should addressed both these stars because this is your major stumbling block for the year, and thus it is very important for you to chant the mantra of the Medicine Buddha (TADYATHA OM BHEKANDZYE BHEKANDZYE MAHA BHEKANDZYE RADZA SAMUGATE SOHA) every day for 108x a day, and carry the Illness Suppression Amulet with you. Furthermore, to manage the Yin Chia Xing, it is important for you to have the Traditional Sutra Amulet in your bedroom. If you are married put the Traditional Sutra Amulet in your living room or the second most frequently used room. Furthermore, you are also in side conflict with the Annual Conflict Star / Yearly Conflict Star a negative energy star that has the power to create a lot of problems and hindrance to your good luck. To protect yourself from this star please carry with you the Vajrapani Ruel or wear a gold Kalachakra pendant. 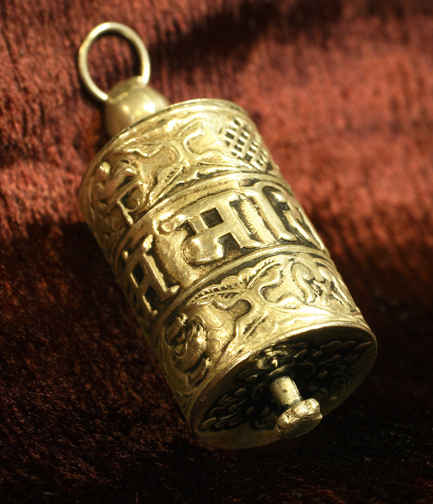 You should also place a Traditional Sutra Amulet on the Northwest Sector of your house. However, the extreme good news is that you have the Golden Deity Star, which is one of the best stars one can have in the Twenty-Four Mountain Star Formula. This should provide you with help from the Buddhas or Bodhisattvas or Taoist Gods or Deities that may prove to be the best thing to happen. Activate this by inviting an image of a Buddha or Bodhisattva or Taoist God or Deity and wear them as a pendant or put the image inside your house. 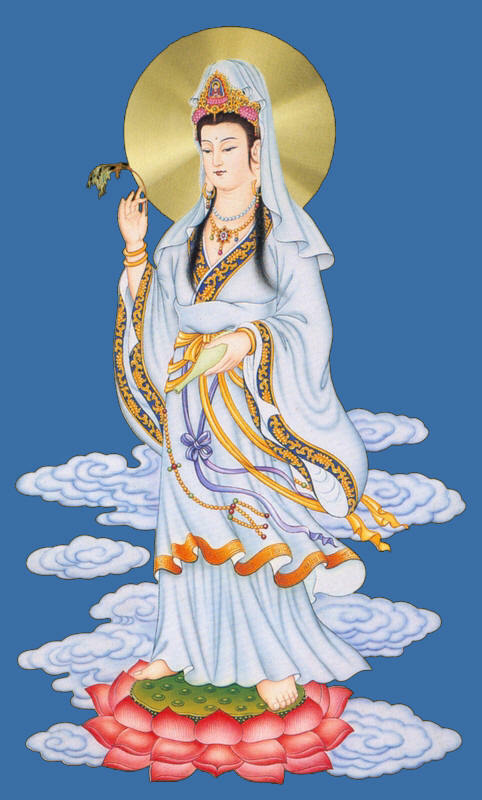 I strongly suggest the following images of Kuan Yin Bodhisattva (Guan Yin, Kuan Shi Yin, Guan Shi Yin, Avalokitesvara, Kannon) if you can have the Thousand Hand Kuan Yin Bodhisattva the better, Earth Store Bodhisattva (Ksitigarbha Bodhisattva), Kuan Kong (Guan Gong, Kuan Yu, Guan Yu, Sangharama Bodhisattva, Qie Lan Pu Sa), Maitreya Buddha (Happy Fat Buddha), Goddess Tara, Yellow Dzambhala (Yellow Jambala), White Dzambhala (White Jambala), or The Monkey God – Sun Wu Kong. This a Maitreya Buddha pendant, who is famously called as the Happy Fat Buddha. This is made of 24k gold and is from my private collection. I chose this pendant because of its nice facial features. Again all Pig – born people is prone to illness or accidents that may lead to long – term illness. All of you should have the Illness Suppression Amulet, but special mention must go to the 22, 46, and 52 – years – old Pig because they are the most severely affected by the effects of the said illness star. Wealth forecast is generally good for all Pigs. Remember that the forecast for each animal sign is done in a general manner. Sometime the time of birth and day of birth makes a lot of difference in terms of luck. Nevertheless, you have to realize that one has to really get protected if you have some of the negative stars, especially the #5 Flying Star (Wu Wang, 5 – Yellow Star) and the #7 Flying Star (Violent Star). In Feng Shui, protection and cure is given more importance than enhancement of the good star. So if you find yourself in a tight budget because effective cures and real cures are naturally quite pricey, remember the key is to protect first. At this point, I also would like to add that it is also quite important for you to read the other posts on this series, because there are times that you have a good star but then your room or office or direction of your head when you sleep is in the bad sector, then it might severely affect your luck. For example, you might have #1 Flying Star (White Victory Star) but then you stay in the South, then the Wu Wang of the South might severely affect the good effect of the #1 Flying Star. Or for example you are Sheep that is affected by the #7 Flying Star (Violent Star) and side afflicted by the Wu Wang, but then you happen to stay in the Northwest who happens to have the Golden Deity star, then you can activate your Golden Deity star to help give you added protection from your bad star. You get what I’m trying to say? The worst case scenario is you are Sheep that is already affected by the #7 Flying Star and side afflicted by the Wu Wang, then you happen to stay in the South then you become even more afflicted by the Wu Wang. So you must cross reference the stars of your Chinese Animal Zodiac Sign (Chinese Horoscope) with the stars of the compass directions and also take note of the effects of the Bazi Chart of the year. Lastly, aside from the Horse and Sheep who really needs to have the Five Element Pagoda and Gold Kalachakra, if you really cannot have all the recommended cures and enhancers, then at least have the following: GOLD EARTH STORE BODHISATTVA PENDANT (stress is given on the gold, not copper, not silver, not brass, not stainless or jade) because aside from the effects of the image in giving us more power thru the earth element and resources thru its metal element the end of the year is also ruled by Hostile Energies and it is the image of the Earth Store Bodhisattva in gold that will help protect us from these hostile energy, VAJRAPANI RUEL, and to a certain degree Citrine. I also would like to add that at the end of the day, especially those whose forecast is quite negative or grim. I would like to share with you a short story about my reader who became a friend – BM. BM is an Ox who as we know is affected by the extra strong Wu Wang of 2016. On top of that, her bedroom is in the Northeast. We still have one month to go, but BM seems to have surpassed 2016 still strong. Sure she had some bumpy times this 2016. But nothing that is so bad that would make her really cry. Why? She has all the cures that she needs but more importantly, in fact more important than the cures is that BM has planted the seeds of good deeds, of love, of compassion, of kindness a long time ago. And she continues to plant those seeds of goodness with expecting in return. And ironically because she wasn’t expecting anything, and she just kept on planting those seeds of goodness without any other intentions but simply to do good, she is reaping the fruits of those seeds now, and those seeds is what made her survive 2016. But more importantly, she knows the power of prayers, constant prayer and not when needed only. Her prayers protected her also. Even if her prayers are mostly for other people. 2017 Year of the Fire Rooster Feng Shui Forecast for the 12 Chinese Animal Zodiac Signs (Chinese Horoscope)! As a Feng Shui blogger and to some extent a very reluctant Feng Shui consultant ( I still cringed with the term consultant being associated with me ), I find it easy to write the articles I post on this blog. The reason being is because I only write about things that I have studied, experienced, or would have heard a first hand confirmed testimonial. This post is quite different, I have known about this topic for quite some time, I even aspire to have one, but the truth is my knowledge this thing is quite limited, I haven’t experienced it’s effects, and because the last time this thing was created was 40 to 50 years ago, then there would be very little confirmed first hand testimonial about this. I’m talking about the Vajrapani Ruel. Briefly speaking, a ruel, for the lack of appropriate terms, a ruel is a kind of Buddhist amulet. It is believed to be the most powerful form and the most effective amulet in the realm of Buddhism. But before we go into Vajrapani, I believe it is worth talking about Vajrapani first. Who is Vajrapani? The straight answer is that Vajrapani is a Bodhisattva, a Bodhisattva that is in the level of Avalokitesvara (aka Kuan Yin) and Ksitigarbha. However, simply saying that Vajrapani is a Bodhisattva in the level of Avalokitesvara or Kuan Yin and Ksitigarbha, simply won’t do him justice. For those who understands Buddhism as a loving and calm type of religious order will be surprise that arise a Bodhisattva like Vajrapani who is famous for his wrathful form. To be completely honest, there are a lot of wrathful deity or images in Buddhism, but the wrathful form does not represent the fact that they are angry but more of what they represents, a lot of these wrathful forms represents protection and wealth. Vajrapani is one of the Bodhisattvas that are highly revered in all Buddhist tradition. But he holds special position in the Lotus family. The Lotus family is headed by Amitabha Buddha and is surrounded by Avalokitesvara or Kuan Yin, Manjushri and Vajrapani. Vajrapani is also a member of the Vajra (thunderbolt) family, which includes Yamantaka and Akshobya, which is the lord of the Vajra family. Vajrapani is also one of the earliest Bodhisattva that appeared in Mahayana Buddhism. As mentioned he is being part of the Lotus family, he automatically became a member of the three protective Bodhisattvas that surrounds the Buddha. 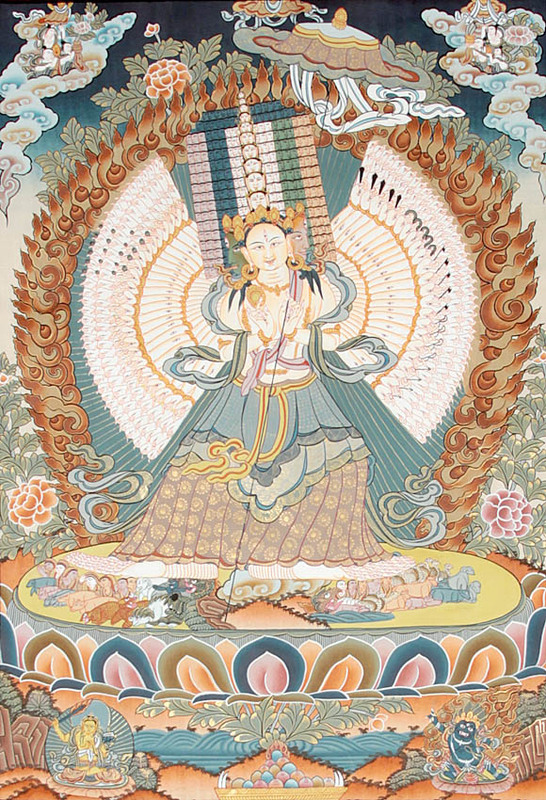 Kuan Yin or Avalokitesvara manifests the Buddha’s compassion, Manjushri manifests the Buddha’s wisdom, and Vajrapani manifest the Buddha’s power. 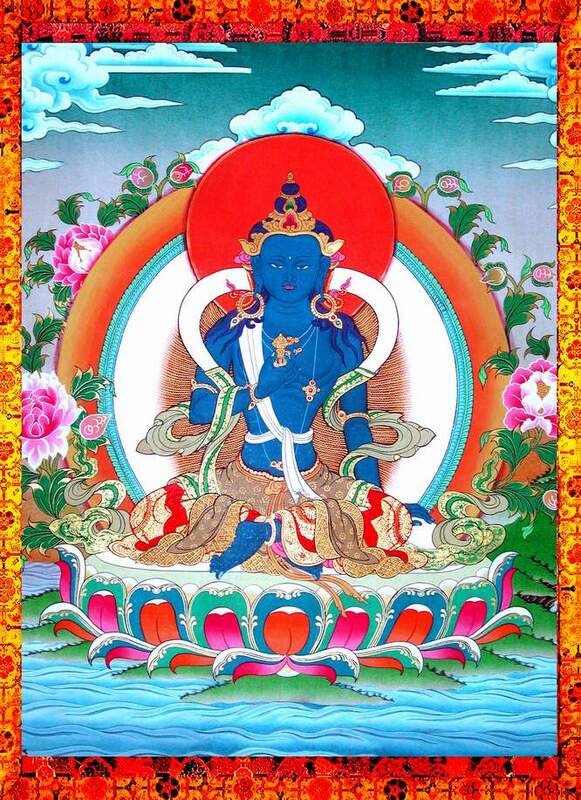 Furthermore, Vajrapani also manifest the power of the 5 Tathagatas. Image of the Vajrapani in a peaceful form with Avakolitesvara and Guru Rinpoche. 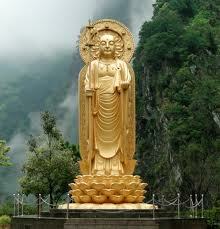 The biggest image is that of Amitabha Buddha. Amitabha Buddha has also given Vajrapani of becoming the protector and guide of the Historical Buddha, or Shakyamuni Buddha when he was still a human Bodhisattva. As if that is not impressive enough, Vajrapani is the only the Buddhist Bodhisattva or to be more accurate deity (as he was then still a deity) to be mentioned in the Pali Canon. He is also the only Bodhisattva worshipped in Pure Land Buddhism, Tibetan Buddhism, and in Shaolin Monasteries. Namo Vajrapani Bodhisattva in his peaceful or zen form. Vajrapani is also one of the first Dharmapalas mentioned in all Pali Canon texts. Dharmapalas are ‘fearsome’ beings in wrathful form, sometimes with several heads, and hands, and feet. They usually have red, black or blue (such as in the case of Vajrapani) skin. They will always have very fierce expressions and sometimes they come with fangs. But what one needs to understand is that Dharmapalas are depicted in such form to communicate their strength and their power over all evil. But Dharmapalas, despite of their terrifying look, are actually Bodhisattvas or Buddhas that still embodies high compassion, they only act wrathful for the benefit of sentient beings. Vajrapani has a wrathful look to symbolize a yaksa to help generate ‘fear’ in sentient beings to loosen up his dogmatism and also to communicate to lower beings that he is protector Bodhisattva. He’s in a warrior pose to signify his immediate action. His loincloth is made of a skin of a tiger, the head of the tiger can still be seen somewhere on his left knee. 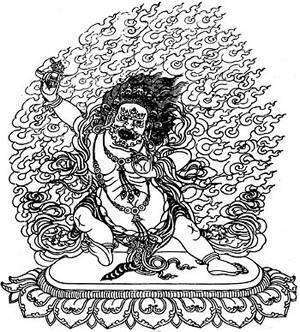 Vajrapani’s right hand brandishes a Vajra (thunderbolt) to signify wisdom in fighting off his opponents, and at the same time to signify the capability to cleans the surrounding of negative chi or energy. It also signifies one of the greatest natural weapons in the universe. His left hand holds a magical lasso, which he uses to bind demons or evil intent. Around his neck is a serpent necklace, to signify his power to heal and to bring good luck. He also has a third eye, which depicts his ability to see through what is not obvious. He is also always depicted with a whole body flame halo, because this represents awakening and suppression of hostile energies. It is important to understand that unlike in Taoism were there image represents their ‘physical form’, images of the Buddhas or Bodhisattvas that we see are just representation of the things that they want to communicate. Needless to say, enlightenment can’t be represented in any form. So the Zen images of the Buddhas or Bodhisattvas, just like the fierce images of the wrathful Buddhas or Bodhisattvas are all ‘misrepresentation’. Surely, we cannot imagine all the Buddhas and Bodhisattvas sitting around all day on lotuses meditating. The truth is our mind won’t be able to grasps even a fraction of the concept on how they work, that’s why they have to be translated through images, that in turn gathers some of their energy by virtue of it representing them. In the Pali Canon texts, Vajrapani was described as a Yaksa (sometimes spelled as Yaksha). A Yaksa is a kind of warrior and guardian spirit, like a General. He became a Bodhisattva because of an incident that happened to Shakyamuni when he was still a living Bodhisattva. When he was still a living Bodhisattva, Shakyamuni went into meditation, where he encountered a Brahmin entity name Ambattha. Ambattha was really rude to Shakyamuni because he believes that Shakyamuni was of a lower social caste. He literally taunted Shakyamuni. Shakyamuni then also questioned Ambattha about his ancestry, which is supposed to have been totally ‘humble’. Ambattha refuses to answer Sakyamuni’s questions and the situation is about to escalate. Ambattha was then already in the spirit world, while Shakyamuni was still a living Bodhisattva, Vajrapani who is a protector and guide of the human Shakyamuni appeared and manifested himself. Ambattha then saw Vajrapani on top of Sakyamuni’s head about to strike him. Note this as a realization of an ancient prophecy. Ambattha was really scared and promptly answered Sakyamuni’s question. Ambattha eventually became a Yaksa or a Deity and Vajrapani became a Bodhisattva. It is important to note that Vajrapani and other similar wrathful figures in the Buddhism pantheon are not representative or manifestation of ordinary anger, there is no such thing as ‘righteous anger’ in Buddhism. The wrathful image represents their power, their fearlessness, and their total awakened mind. Remember that Vajrapani is and will always be a very compassionate Bodhisattva. In my post above, I gave an introduction of Bodhisattva Vajrapani. That particular is a short and incomplete account of who Vajrapani is, but for now, it should be able to show us his importance and the depth of his power and significance. He alone has the wonderful opportunity of being the assigned protector and guardian of Shakyamuni as a living Bodhisattva. I would now like to discuss about the Vajrapani Ruel, as mentioned in the previous post, for the lack of an appropriate term, a ruel is a form of amulet, but it is said to be the highest form of amulet. 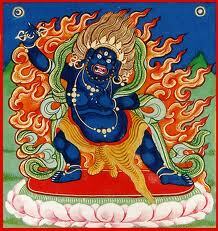 I have heard about the Vajrapani Ruel several years back and were in search of it. However, since it is so rare, I wasn’t really surprised that I didn’t found any. In fact, the last time a Vajrapani Ruel was made was some 40 to 50 years ago! I was so happy when my Guru Lama contacted me to inform me that a Vajrapani Ruel is available, 40 to 50 years since it was last made. There are three kinds of known and accepted ruel, and depending on what Buddhist tradition you follow, it is said that the Vajrapani Ruel is the most powerful one. Why does it take so long to make the Vajrapani Ruel? The Vajrapani Ruel can only be made by a select group of highly enlightened lamas. These are lamas who can access those Wrathful images through a certain form of non – physical tantric meditation. But other than the fact that only a very few select group of high lamas can only make this particular ruel, there are certain conditions and ingredients that can only be access once every few years. It would be impossible for me to list down all the ingredients, because according to my Guru Lama, the ingredients of the Vajrapani Ruel consist of 70 to 90 different ingredients. Some of these are Namtso Salt that I recently wrote about, a certain soil that can be found only inside a certain place in Tibet. But more than various precious herbs, rare plants, crystals, one very important ingredient of the Vajrapani Ruel is a precious relic from a high lama. The Vajrapani Ruel looks simple, maybe even rustic, but this simple amulet is packed with a special talisman paper inside, with various ingredients, which includes Namtso Salt, soil, various herbs and plants, crystal, and a relic from a high lama. It’s important to put the ruel inside a amulet holder or something sturdy as to not ruin it. If the cloth had tear which exposes or spill the ingredients inside, the ruel becomes useless. Those who are not Buddhist and are not familiar with the importance of relics might find this a little iffy. Relics are basically small pearl like objects found in the ashes of the dead lamas after they’re cremated. Weirdly, it is only high lamas and really good people produces these pearl like objects, and are most often than not are green in color. These relics are crushed into powder, mixed with the other ingredients and baked. In the world only very few selected people can really own a relic. The karmic merit must be so high before one will have the chance to own a relic, so having the Vajrapani ruel, is an extremely fortunate and meritous thing to have. 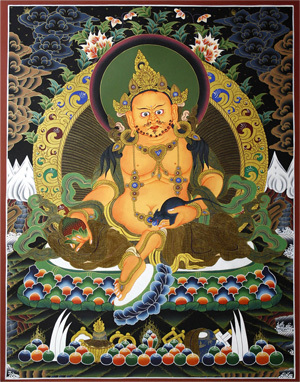 Having the Vajrapani Ruel has various benefits, one of which has been mentioned several times. 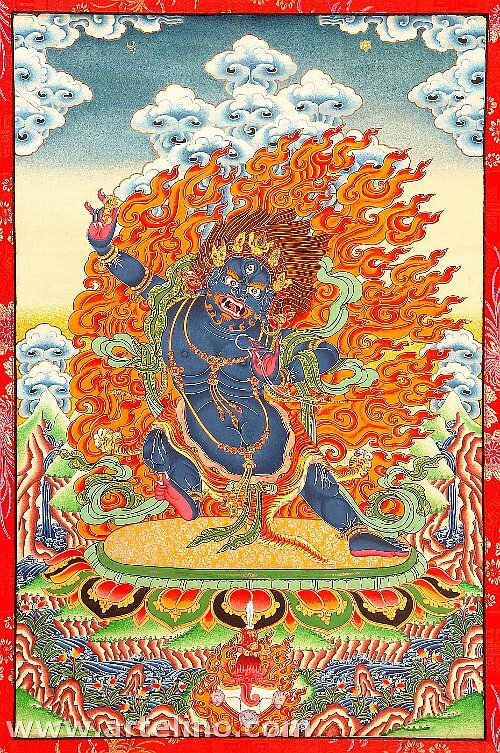 Vajrapani Ruel is one of the most powerful protective amulets. Again, depending on what Buddhist tradition you ask, some of them even consider the Vajrapani Ruel more powerful than the Kalachakra with its protective energies. The difference of the Kalachakra and the Vajrapani Ruel is basically the Kalachakra is a very powerful protective symbol because it’s actually a compressed symbolic script. The Vajrapani ruel is in the strictest sense of the word an amulet. But more than it’s protective properties, the Vajrapani Ruel has the ability to cleanse immediate negative energy and chi. It also gives you a upper hand in all your undertakings. More than that, it also has the ability of bestowing tremendous wealth luck. It also has the ability to bestow wisdom especially to people who people who are in the field that research and intellectual stimulation takes the front seat. Because the last Vajrapani Ruel was made 40 to 50 years ago, it’s quite difficult to get first hand testimonials, but my Guru Lama shared some with me and will be sharing them in a few days. According to my Guru Lama, a Vajrapani ruel can only be made inside Tibet, and he now has the latest batch of Vajrapani Ruel made available which was recently made. This particular batch of Vajrapani Ruel was smuggled out of Tibet together with the Namtso Salt. The World’s Most Powerful Amulet in the Buddhist Pantheon Called the Vajrapani Ruel. Financial Problem of An Illegitimate Child Solved When He Was Able to Claim His Inheritance Thru the Help of the Vajrapani Ruel: A Personal Testimony of A Reader. A Problematic Businesswoman Experienced Her First Vajrapani Ruel Miracle Within Three Days of Acquiring It: Vajrapani Ruel Miraculous Personal Testimony of A Reader. Financial and Wealth Blessings from A Problematic Sale of A Property: A Personal Testimony About the Vajrapani Ruel and Other Amulets in the Words of A Reader! The Proof of the Pudding is in the Eating and Sometimes We Should Realize that Simple Can Be Quite Good: Some Vajrapani Ruel Miraculous Stories and the Lesson We Can Learn from the People Who Experienced Them. “Suffering” May Be a Form of Cleansing; A Miraculous Pay Raise After More than 19 Years; And Other Miracles: A Personal Vajrapani Ruel Miraculous Stories of A Reader! There Are No Simple and Small Miracles: A Lesson from the Personal Testimony of A Reader! A Mother’s Wish for Her Children to Have A Secured Future Granted By the Vajrapani Ruel (An Unusual Financial Blessing): A Personal Testimony of A Reader! A Financial Blessing or Miracle for the Born – Again Christian Who Is Not A Believer of Amulets: How A Simple Miracle Turned A Woman into Believing that there is Indeed Something with the Vajrapani Ruel! Financial Luck Received After Receiving the Vajrapani Ruel and Descendant Luck Activated by the Traditional Sutra Amulet: Two Different Personal Testimonies of A Reader and How She Still Saw the Simple Miracle As A Miracle! Retirement Pay Withhold for 4 Years Released, Dream House Finally Within Reached, Debt Paid Off – Three Different Problems Solved With One Significant Financial Blessing: A Personal Testimony of A Reader About the Vajrapani Ruel! Academic Excellence; A Promotion with A Small Raise in Salary; A More Peaceful Work Environment: A Reader Shares the Joy of Having Simple Miracles from the Vajrapani Ruel! Count the Living and the Good News: The Lesson of My Nephew’s Death and the Story of A Reader Who Experienced Health and Financial Miracle from the Vajrapani Ruel and the Avatamsaka Traditional Sutra Amulet! Becoming a Full Fledged Lawyer and Academic Excellence Attributed to the Traditional Avatamsaka Sutra Amulet and the Vajrapani Ruel: Simple Miracles Shared by EV.